The Giro d’Italia was turned upside down today in Horsens, Denmark, due to Robert Ferrari’s sprint. The Italian of team Androni darted right, hit Mark Cavendish‘s front wheel and caused a crash that also took out race leader, Taylor Phinney (BMC Racing). Team Sky’s sprint leader hit the road hard on his left side in the final 200 metres, but then got up and walked over the finish line carrying his bike. Afterwards he re-mounted and rode toward the team bus, stopping first to congratulate his former team-mate Matt Goss (Orica-GreenEdge) on the stage win. “He was a bit pissed off, a bit gutted,” Geraint Thomas told Cycling Weekly. Thomas led Cavendish into the sprint, but lost him in the final kilometres. He kept looking back over his shoulder to see where he was and to make sure he’d be in position to repeat yesterday’s win in Herning. Cavendish was a little far back, but jumped to follow Tyler Farrar (Garmin-Barracuda). They surged up the right side, when Ferrari shot right and tried to pass behind Farrar. He took out Cavendish, Arnaud Démare (FDJ-BigMat) swerved and avoided Cavendish’s head and Elia Favilli (Farnese Vini) bunny-hopped his body. 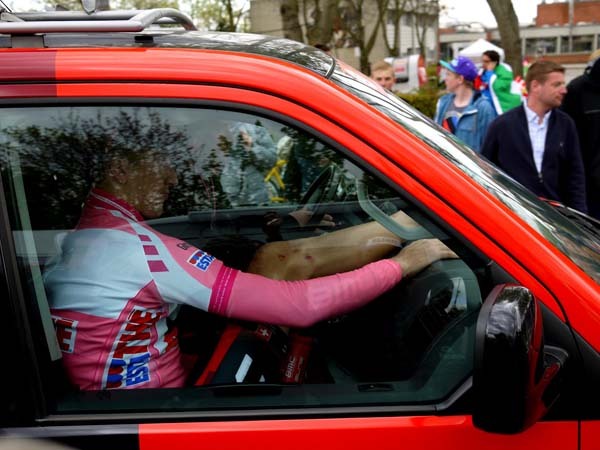 Pink jersey, American Taylor Phinney went down in a subsequent crash. He nursed his right ankle and had to cross the line in an ambulance. The jury awarded he could keep the jersey, in an action similar to the one that allowed Daryl Impey to keep his after the Tour of Turkey crash in 2009. 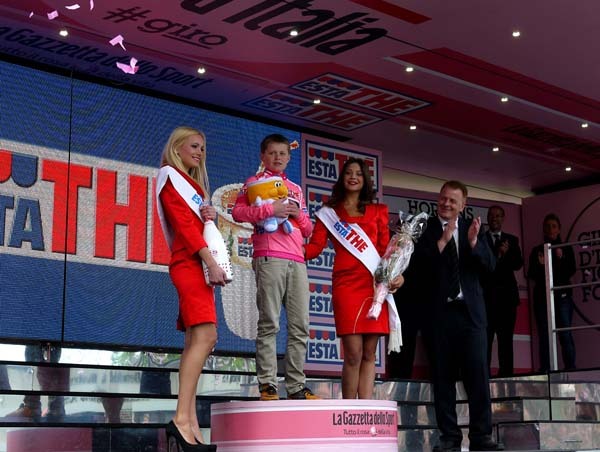 The award ceremony went on, a young boy took the jersey in Phinney’s place. 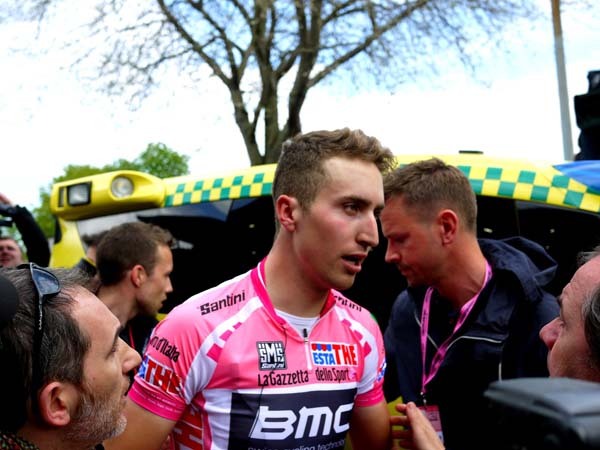 Phinney then returned in the ambulance and accepted the jersey, right ankle wrapped and race numbers dangling over his backside. Goss won the first Grand Tour stage for Australia’s new top division team, Orica-GreenEdge. However, he wasn’t pleased with Ferrari’s actions.